The San Francisco Volcanic Field is a 4,700 square kilometers (1,800 square miles) area in the southern boundary of the Colorado Plateau. The field contains more than 600 scoria cones active in the past six million years. 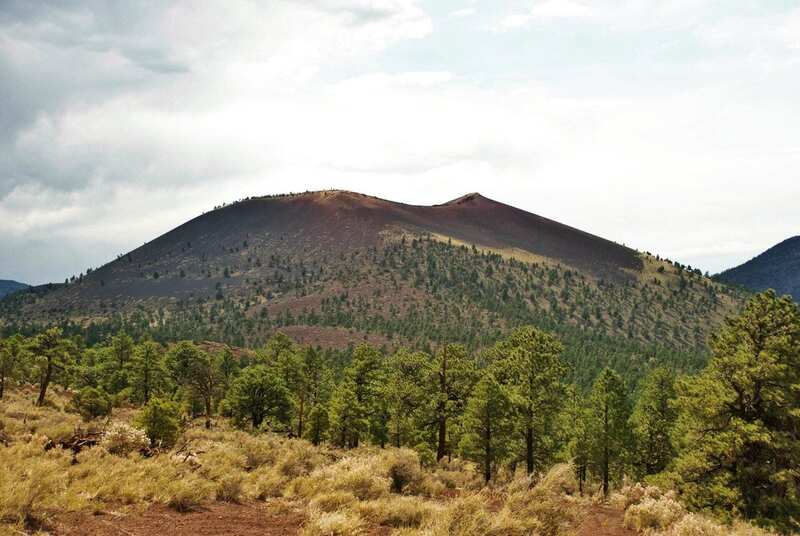 The Sunset Crater is the youngest of these scoria cones, and was active about 1000 years ago. This eruption heavily affected prehistoric inhabitants over a wide area, forcing migration and dramatically altering settlement, subsistence, economic, and ritual. However, despite these and several additional archaeological studies, only a few have focused on the physical characteristics of the eruption. The eruption developed in three distinct phases: an initial fissure phase, followed by a highly explosive phase, and a final low explosive waning phase. The first phase was characterized by the opening of a 10-km-long fissure, which produced spatter mounds (Gyp Crater), a lava flow effused from the southwest end of the fissure (Vent 512 flow), and a 0.01 cubic kilometer dense rock equivalent (DRE) of pyroclastic fall deposit (Unit 1). During the second highly explosive phase, the activity migrated to the northwest to evolve into a single-vent eruption, which formed the main scoria cone. The central vent activity was initially characterized by variable eruptive styles, which started the process of cone building, deposited a second pyroclastic layer (Unit 2; 0.01 square kilometers DRE), and started the effusion of the two main lava flows (Bonito and Kana’a). Following the initiation of effusive activity, the eruption increased in explosivity to produce three sub-Plinian units from the central vent (Units 3, 4 and 5), which emitted more than 0.22 cubic kilometers DRE of basalt, with associated eruption columns >20 km high. A final waning phase produced several units, commonly discontinuous and reworked (< 0.01 cubic kilometer DRE cumulative volume). Sunset Crater volcano represents an interesting case of monogenetic volcanism in that its activity was characterized by highly explosive eruptive phases up to sub-Plinian in scale and intermittent episodes of lava effusion that heavily affected pre-historic communities in the area. 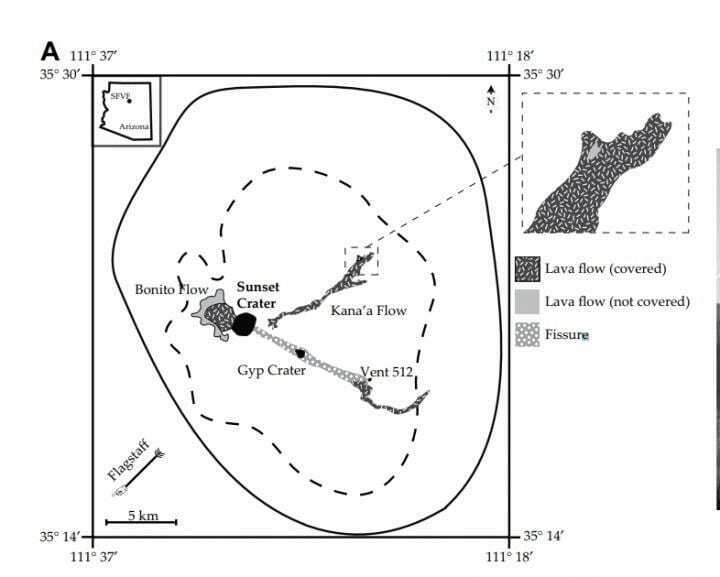 The comparatively large volume of pyroclasts, the high eruptive columns and high mass eruption rates make Sunset Crater the most explosive monogenetic eruption studied to date. Explosive basaltic volcanism like this should be considered when assessing volcanic hazards in continental settings, such as in the western United States.